In this Saqqarah Beige Part II, we see inscriptions and designs from Ptah-hotep, from 2150 BC. The tomb of this Egyptian minister is the Saqqarah region renowned for its pyramids and mastabas, a sacred region so important to Egyptian life and afterlife and a wonder of the world in terms of its colossal structures and magnificent art. 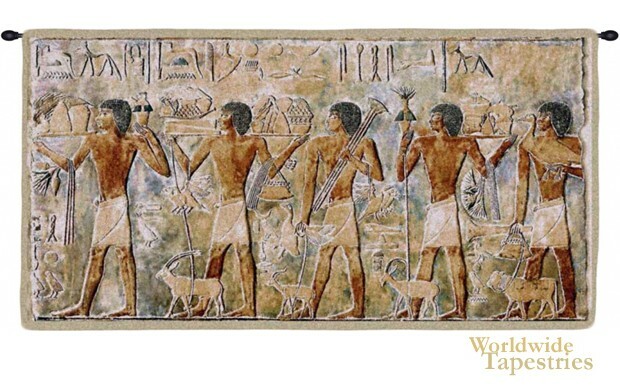 Here we see sacrificial animals for the pharoahs, as well as hieroglyphics above the procession of people. This Saqqarah Beige Part II tapestry is backed with lining and tunnel for easy hanging. This Egyptian style tapestry is lined and has a tunnel for easy hanging. Note: tapestry rod and tassels, where pictured, are purchased separately. Dimensions: W 56" x H 35"